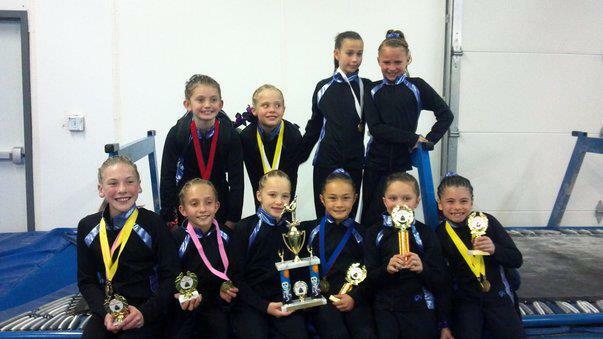 It was a Clean Sweep for Loveland’s Premier Gymnastics of the Rockies this past weekend at the Apex Monster Mash 2011 in Littleton. The competition took place October 29and 30. All three teams (Levels 4, 5 & 6) took home the Championship Trophies. In the Child Division Mackenzie Nedom placed 3rd and Abby Budd placed 4th. In the Junior Division Madison Blair placed 1st with a score of 38.550. Madeline Madere placed 2nd. In the Senior Division Taylor Dower placed 1st with a score of 37.100. Alyson Buckner tied for 5th. In the Child Division Katie Parsons placed 1st with a score of 37.625. Lauren Thomas placed 2nd, Abby Stoops placed 3rd, Emily Trojahn placed 4th and Kira Sanchez placed 5th. In the Child Division Kairey Vela and Sidney Strizki tied for 2nd place. Tatum Graham placed 5th. In the Junior Division Aryn Archambeau placed 1st with a score of 37.725. 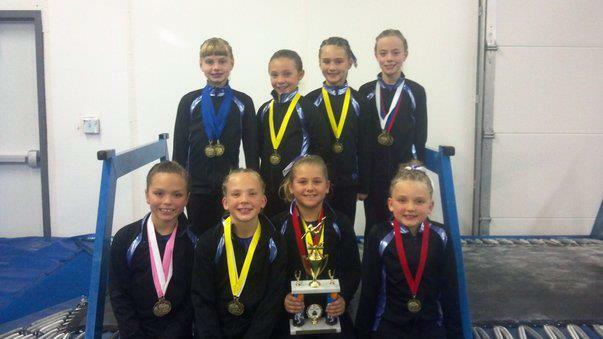 In the Child Division Nedom placed 3rd on Floor and 5th on Vault, Bars and Beam. Budd placed 4th on Beam. Ali O’ Donnell placed 2nd on Beam. In the Junior Division Blair placed 1st on Vault (9.900), Bars, Beam and Floor. Madere placed 2nd on Beam, 3rd on Vault and 4th on Bars. Gracie Wadlington placed 4th on Beam. In the Senior Division Dower placed 1st on Bars and Beam, 2nd on Vault and 3rd on Floor. Buckner placed 3rd on Vault, 4th on Beam and tied for 5th place on Bars. In the Child Division Parsons placed 1st on Beam (9.925) and 2nd on Bars and Floor. Thomas placed 1st on Vault and Floor, 3rd on Bars and tied for 5th on Beam. Stoops placed 3rd on Beam and 4th on Bars and Floor. Trojahn placed 1st on Bars and 2nd on Vault. Sanchez placed 4th on Beam and 5th on Bars. Sarah McCormick placed 3rd on Vault. Alexis Copeland tied for 5th place on Beam and Kylla Justice placed 5th on Floor. In the Senior Division Morgan Kenner tied for 3rd place on Beam, 4th on Floor and 5th on Vault. In the Child Division Vela placed 1st on Bars and 4th on Vault. Strizki placed 3rd on Bars, 4th on Beam and 5th on Vault. Graham placed 1st on Vault and tied for 4th on Floor. Nikki Sims placed 4th on Bars and Abbie McCrimmon placed 5th on Bars. In the Junior Division Archambeau placed 1st on Vault, Bars and Floor and 2nd on Beam. Jayde Minnis placed 2nd on Floor and 5th on Bars.